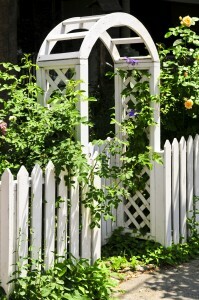 An arbor makes an elegant addition to any home garden. Like a pergola, it provides an additional source of shade on hot summer days, and gives your garden area an inviting flow of movement. With an entryway structure in place, your garden or backyard becomes a destination rather than merely a backdrop, and your home will feel bigger and more dynamic to your guests. While the pergola is less frequently used as a framing for plantlife, arbors remain a beautiful arrangement for climbing plants to grow on and give your garden a sense of wonder and magic. Backyard areas are more inviting when they have some sort of architectural framework. An arbor decorated with plantlife can do this while accentuating the natural beauty of outdoor life. Our quality vinyl pergolas can be designed to match any home, backyard or garden. Rediscover the charm of the outdoors and call us for a free consultation to find out how an arbor can enhance your home.